Frank Romano is the Founder of “Golden Gate K9”. Franks love for dogs started early in life when at age of 4 his parent’s apartment was burglarized and then they bought a German Shepherd named Heidi. Heidi had natural protective instincts. Since then dogs have always been a huge part of Frank's life. In 1987 while on active duty in the US Army he entered the Department of Defense's Military Working Dog Program. He is a graduate from the Patrol Dog Course, graduated with honors from the Detector Dog course, and graduated from the Kennelmaster/Supervisor/Trainers Course. He was the only U.S. Army Kennelmaster to work, deploy, and transfer with a Bomb Patrol Dog from 1991-1995. He served in the United States and abroad. He quickly became a troubleshooter for the Armed Forces Command, transferring to kennels that were unable to get certified for years and turning them around. He received numerous awards and medals for his work in the Military Working Dog Program. In 1995 he ended his 11 year Active Duty Army career and entered the US Army Active Reserves where he retired as a Master Sergeant in 2004. In 1995 he was hired by the California Highway Patrol. In 1997 he was awarded Peace Officer of the Year by the Marin County Police Association. He then was reassigned to the Golden Gate Division Criminal Interdiction and K9 Unit. Here as an additional duty he quickly became Golden Gate Division’s K9 Trainer. In 2000 he was assigned a K9 named “Rexx”. He and his K9 Partner were very successful both on the streets serving the community and in competition. In 2001 Rexx won 3 Gold Medals and 1 and Bronze Medal at the Police Olympics. 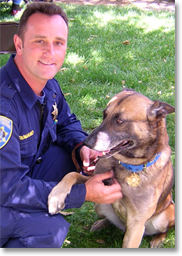 In 2002 Rexx was Western States Police Canine Association Canine of the year. In all, the team won 48 trophies at Police K9 trials over Rexx’s career. In 2008, Rexx developed cancer and passed away. As a result, Frank was asked to take a job as the Departmental Master K9 Trainer at the agencie's headquarters in Sacramento, CA. Here he was responsible for testing potential K9 candidates for purchase, training the dogs and handlers at the academy, running the kennels, and assisting with running the Departmental K9 program. In 2010 Frank was assigned another K9 named “Becks” a dual purpose Patrol Explosive Detection Canine. Frank Still had the additional duty as the Departmental Master K9 Trainer and Golden Gate Division’s Master K9 Trainer till 2013. In 2011 Frank started his dream of owning and operating a complete Commercial Kennel Facility and opened Dogfather K9 Connections. In 2012 Golden Gate K9 Training was born and thrives to date. In 2016 Frank retired from the California Highway Patrol. At Golden Gate K9 he continually coaches handlers to train their K9. Frank also dedicates his time to educating Public Service Employees and the General Public in: K9 Care, K9 Supervision, K9 Selection, K9 Training, K9 Deployment, K9 Utilization, K9 Report Writing, and K9 Expert Witness Testimony. In 2018 Frank’s assigned CHP K9 “Mr. Becks” suddenly passed away. This was the end of a chapter in Frank’s life. During Frank’s approximately 16 years with the California Highway Patrol’s K9 Program his call sign for most of it was “Golden Gate K9”. Now, Golden Gate K9 is Frank’s calling today. In 2019 Frank extended his Detector Dog School to the General Public and Private Businesses. Once a K9 is preselected by Frank to have the drives it takes to do the job, you supply the target odor and we will guarantee your K9 will be proficient in locating the target odor of your choice or you pay nothing. Frank is a California Police Officer Standards and Training K9 Evaluator. Mario recently retired after 35 years of Law Enforcement as a Deputy Sheriff. Mario's love for dogs started as a young boy growing up in the country where his family always had dogs. But Mario's love for Police dogs started when he watched his first K-9 Trials at the California Police Olympics. He worked for the Humboldt County Sheriff's Department for two years and then in 1978 moved to Santa Rosa, California where he went to work for the Sonoma County Sheriff's Department. Mario started working his first Patrol dog in 1979. 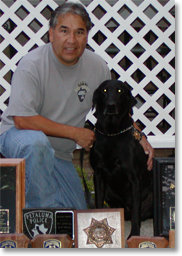 Since that time Mario has handled (3) Patrol Dogs (Montana, Smoke & Ranger) and (2) Narcotics Detection Dogs (Chiva & Lucy) for a total of 16-years handling dogs. Mario still works as a part-time Deputy in the Sheriff's Marine Unit, and Court Security. Mario has been assisting with training the Sheriff's Department K-9 Unit for the past six and a half years, and is currently the President and a founding member of the "Sonoma County Deputy Sheriff's K-9 Association." Mario is also Vice President and a founding member of the Sonoma County Chapter of the "NLPOA," National Latino Peace Officers Association. He is also a founding member the Sonoma County Sheriff's K-9 Trials held for the past five years. Mario has worked as an Evaluator for the Santa Rosa JC Police Academy since 1983. Mario has also worked in the following Units; Helicopter, SWAT, Motorcycle, FTO, EOD, Marine, Narcotics, and Property Crimes, to name a few. In 1981 Mario discovered the need for a county ordinance to protect the Sheriff's Department Canines from persons teasing, agitating, harassment and striking the dogs. During that time there was no state law (600 (a) PC) prohibiting people from these acts. So, Mario authored Sonoma County Ordinance 19-12,-Injuring or Teasing a Police Dog a Misdemeanor crime and arrestable offense. Mario has competed in numerous K9 trials throughout California and has won numerous awards, to include Silver and Gold Medals at the California Police & Fire games. When not working, Mario likes to hunt, fish, and cruise in his 57 Chevy and son's 66 Mustang. 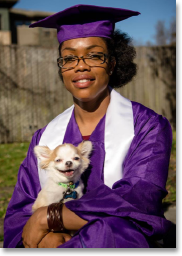 Brittany recently graduated with a Bachelor of Science degree in canine studies from Bergin University of Canine Studies. Her goal from the moment she heard of the school’s existence was to become a police dog trainer. She first became aware of the amazing work well trained dogs could do during her time in the army as a military police soldier. Whilst deployed overseas she worked side by side with some of the finest military K-9’s and handlers the U.S. Army had. After 7 years in the military Brittany was medically retired. Following retirement, she had a goal to get an education to better herself however, not just any education would do she wanted an education that would enable her to gain knowledge and experience in the canine field. So, to obtain her goal, she attended Santa Rosa Junior College where she earned two associate degrees the first in administration of justice and the second in social behavioral science. Once she completed her time at the J.C. she applied to Bergin University to gain her Bachelors’. During her first year at Bergin she met Frank Romano a 30+ year veteran in the K-9 world. She applied for a job at Dogfather K-9 Connections and was hired that spring to be a kennel technician where she learned how to handle a very broad and diverse spectrum of dogs. After a few months she started learning the ropes when it came to police dog training for obedience, narcotics detection and patrol. She also started training her first dog a German Shepherd Malinois cross named Max who was tested and selected by Frank to be a dual-purpose police K-9. During her time training Max, she was also be being taught by Frank the protocol of police dog training and tactics. Max could be challenging at times but what better way to learn but from a challenge. Max will always have a place in her heart. Brittany now has been involved in training several K9’s at Golden Gate K9. Brittany has a dog companion of her own which is a 4lb Chihuahua named Joey. Joey is adored by Brittany as he is family to her. After working for Dogfather K-9 Connections since May 2017, Brittany is now a kennel manager and trainer at Golden Gate K-9 for both patrol and scent detection, which to Brittany is a real-life dream come true!